In the past few months, I have to say Grace has turned into a bit of a water bug. And we love every minute! 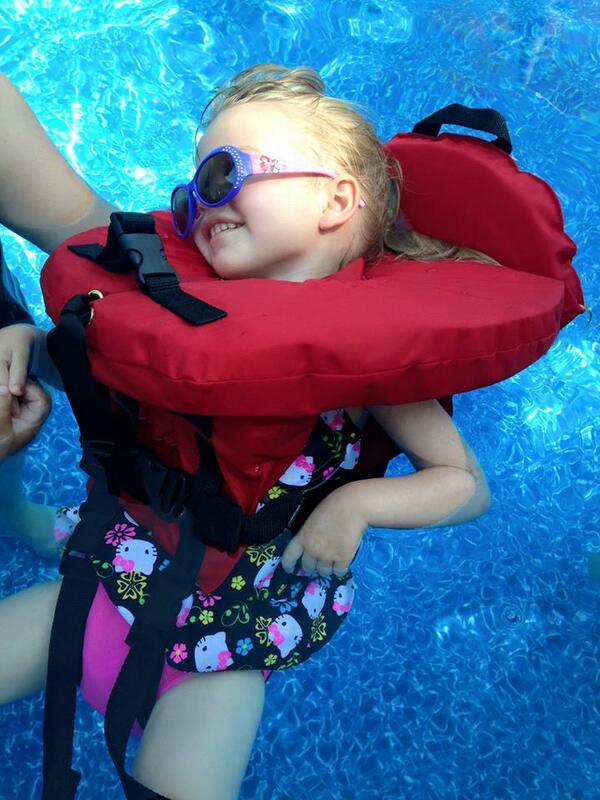 Grace's new life vest is a HUGE hit!! She loves being able to float by herself. Although we have always tried to take her swimming, last summer, she did not enjoy it. 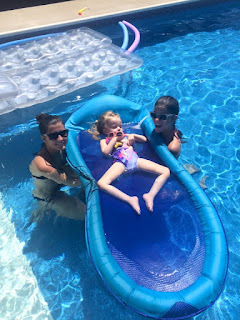 Whether it was the bright sunshine bothering her eyes or just being too tired, she just cried and cried when we took her swimming, no matter how we tried to stand on our heads to make her smile. When her Make-a-Wish trip was granted to Hawaii, we decided we should start early working on swimming again. Fortunately for us, we've had lots of chances. From Kyle's aunt and uncle to Central Park, we've been swimming more times this year than anytime before. After speech therapy one Thursday afternoon, Grace and I ventured down to Central Park just the two of us, and she really liked being in the water. 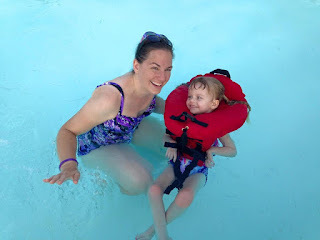 We tried an inter tube and a plastic raft, and she just loved being in the water. Later that month, we headed over to Kyle's aunt and uncles where his cousins just love swimming with Grace. This time, we tried a mesh raft with a pillow, and that really seemed to work well. Grace swimming earlier this summer with Kayley and Kensey. Then another INAD mom shared one of their favorite summer tools, a life vest, designed for children with special needs. It looked amazing. Our own community pool hosted a special night just for Princess Grace, and our very generous community raised more than enough money to cover the cost. We made sure to get it ordered in time to come before her Make-a-Wish trip. I nearly jumped out of the car the day we came home and I saw the box in front of the house when it arrived. And though I was excited, nothing matched Grace's laugh the first time I put her in the water, and she realized she was completely independent and didn't need help from anyone. She was a little tired, but she still loved floating in the pool. I think her precious smile says it all. Then tonight, after a good afternoon nap, we went down to Central Park pool for a community swim night fundraiser, and to say thanks to everyone who donated to help get the vest. She swam for nearly an hour, and smiled and laughed almost the entire time. Lots of the kids came over to talk to her, and she liked splashing with them. I think it's safe to say our little water bug is ready to go to Hawaii next week!